With the crazy, upset victory of Republican Scott Brown, a jerk who, during his victory speech, even pimped out his daughters, saying “…they’re available”. Well, at least they’re over 18 and he’s not inviting statutory rapists to come sweep them away, but that would be poetic justice. One of his daughters was even a horrible contestant on the horrid, “look-what-this-country’s-come-to” show, “American Idol” about five or six years ago and in the immortal words of Simon, that mealy-mouthed Brit, “You’re good, but you’re not fantastic”. That may have been just the way one could’ve described Martha Coakley’s campaign – “good, but not fantastic”. Anyway, that aside, Brown somehow was able to hoodwink Massachusetts voters into voting for him – I think a lot of it had to do with personality and charisma contests in the end. He certainly has no new ideas on how to change or fix anything; the only mantra he kept on repeating was the one-horse-show of the GOP – “No taxes, less government” and he kept repeating, throughout his campaign stump speeches that he would be the “41st” NO vote in terms of the health care bill up in the air right now. So is it all his fault that he won? Did the voters in Massachusetts somehow turn into idiots overnight? Well, not exactly: Martha Coakley, his Democratic challenger was not, in my eyes anyway, that strong a candidate. Her being a woman had nothing to do with it, but it seemed to me that every time I saw her being interviewed on TV or giving a speech somewhere that she was very lukewarm, very “milquetoast” in her campaigning style, she just kept on repeating the mantra, the “party line” about healthcare and typical platitudes that hailed Obama and what the Democrats are trying to get done in congress even as obstructionist Republicans don’t have any ideas to add to the table no matter what bill is being considered. They just want whatever the Democrats do in terms of offering legislation, to fail so they just keep on voting, lock step, in party line 60-40 votes. So far, I’ve seen no bipartisan working together on anything of any substance. What the Democrats sorely needed was a fighter, someone with balls, be it man or woman, that could articulate exactly what it was they stood for and also what a continued presence of a Democrat in the seat held by Teddy Kennedy for 40+ years would mean, not just for the people of Massachusetts, but for the country as a whole. For Massachusetts to elect a Republican to the Senate, something that hasn’t happened since 1972, it shows that it wasn’t Scott Brown by himself who was catapulted into the seat, but the overall ineffectiveness of Martha Coakley. Even though she was in synch with the Democratic talking points and said all the right things, she just didn’t do it with enough “gusto”. Somehow, this former Mass. Treasurer just didn’t have an effective campaign staff and the timid, almost mousy personality of the candidate herself was her own worst enemy. She should have stood up there and repudiated everything Scott Brown stood for and, in contrast, articulate all the benefits that she’d bring to her home state and to the country as a whole. But instead, Coakley decided to go with this “nice” campaign, where nary a negative word was spread, no mud slung and no dirt was dug up on Brown’s record as a state politician to be used against him, so it was almost like Coakley was working for Brown’s team as well. I also think her and her campaign just took it for granted that she would win, after all, no Republican has been elected to the US Senate since 1972. With what was at stake and the obvious closeness of the polls for both candidates – I guess Joe Kennedy (no relation to The Family), being an independent, third party candidate didn’t even really count, since there was no op-eds or articles about him or interviews with him in any publication that matters so people were unable to really make up their minds about a legitimate 3rd party candidate and what he could’ve offered up as a candidate. The only time voters ever really heard anything from Kennedy was during the Senate Debate, where he not only had a chance to enumerate the things he’d bring to Washington, DC, in terms of changing the status quo or at least his vision of what an independent, non-party controlled candidate could offer the electorate in terms of how he’d vote for bills, his ideas about controversial issues, etc. After that it was like Joe who? And from then on up until last Tuesday it was, to pundits and their editors, just a two-way race between a Republican and a Democrat. I think, even if he didn’t have much of a chance in hell to win, Kennedy at least deserved a little ink to get his message out. If nothing else, he should’ve written an op-ed for the Boston Globe or even the New York Times. But I guess he took his underdog status in stride. 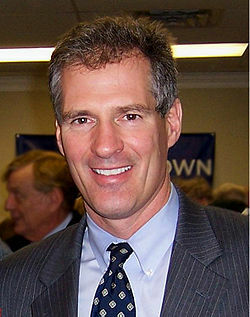 But the real tragedy here is that Scott Brown actually won a seat that many all over the country figured was a shoe-in for a Democratic candidate, Massachusetts being such a liberal state. That, right there was how the Dems lost the seat: hubris. They figured that this upstart, Brown would go down in flames like all the rest of the GOP challengers over the past 38 years. So, instead of hammering the GOP candidate, Coakley and her campaign just seemed to rest on their laurels, speaking at the typical stump speeches, mouthing the talking points of the DCCC and saying how she would be the logical choice to take over the seat left open by the unfortunate death of legendary long-time senator Ted Kennedy. Well it looks like they were proved wrong – way wrong, in their estimation of voters, people whom the Democrats had assumed they had in their back pockets. Instead, it was Scott Brown who kept on hammering the Dems, mostly the recent health-care initiative, still up in the air. Brown’s message was that he would be the “41st senator” on the Republicans’ side, meaning, of course, that he would do everything in his power to kill the bill. It looks like for Harry Reid and his group of now only 59 senators (he needs 60 “aye” votes to overcome a GOP filibuster). Really, in the clips I saw on TV of Brown making stump speeches and talking to reporters he was just saying the same thing over and over – that this health care bill isn’t what the “American” people (whoever the hell they are) and he kept on referring to arcane tax and spend issues associated with the bill that would once and for all (even after all the really good parts have been eviscerated from it just to get the 60 Democratic “aye” votes) give Americans who have “pre-existing conditions” the right to continuing and/or initial coverage instead of being dumped when found out or denied coverage because of something that they now need coverage more than ever for. Well, thanks a lot Massachusetts, you ruined it for everyone else in the country, now nobody’s going to have affordable health care just so you can win a friggin’ election. But we can’t just stop there and say he’s evil incarnate, which is why he won. No, he won because of a lazy electorate who took it for granted that the seat would be filled by a Democrat – they all figured – well, my neighbor’s going to vote for Martha so I’ll just stay home. Plus blame must be laid squarely on the Democratic candidate herself. If Martha Coakley had seen the handwriting on the wall months ago she and her campaign team could’ve overcome this by digging up dirt on Brown, meticulously checking his record as a former State Senator and his other posts as state this and state that. Coakley herself could’ve been a lot more of a fighter and not this “nice, how-ya-’doing?” personality – remember that old maxim – nice guys (and gals) finish last – well, that is exactly what happened on Tuesday – the jerk won and now we as a nation are going to be paying for it. And to think, it all could’ve gone differently had their either been a better candidate or if Martha herself had been up to a challenge she obviously didn’t expect. She should’ve come out swinging and let her side be the ones to tell you what she stood for and how she would work in the Senate, etc, but instead she was blindsided by this upstart. The bright side of all this? Well, it is 2010 and that means it’s a mid-term election year, meaning that not only are some Democrats going to be vulnerable but so are Republicans. Let’s hope that this race will serve as a lesson in how not to campaign and that in the coming months, the economy gets better (something the Dems will be able to take credit for), unemployment goes down and, in general, things start looking up. That will improve the Dems chances at the polls come November. Also – don’t take anything for granted – Teddy Kennedy never did – I remember him saying that in one of his re-election years, when he spoke of his seat as never being a shoe-in, that he worked hard to campaign and keep on getting re-elected. So, don’t hold your breath and wait for the horse race in November, if you want anything good to come out of this country (I’m almost ready to move to London) you’d better do some grass roots organizing in your district – be a delegate, answer phones, do whatever you have to do to get the right people in office and don’t let yourselves get fooled again.